An effective strategy for editing HDR images with layers uses the layers to track your edits — locking them in the file via layers. This allows you to be more consistent, experiment with different approaches to the same image, and go back to any stage in the process to try something new without having to start over from scratch. Following those general principles, you see an example workflow. This takes the basic strategy and turns it into a practical series of steps to follow. There are pros and cons to the layers methodology and workflow — and you certainly don’t have to copy it exactly. It was developed over the years through work with photo retouching and restoration, image manipulation, graphics and Web development, and HDR. Save as PSD. Open up your tone mapped HDR image and immediately save it as a Photoshop (PSD) file. This preserves the original tone mapped file. Also, any layers you add will be preserved and editable the next time you open the PSD file. Preserve the Background layer. Preserve the Background layer (as shown in this figure) as the inviolable source image by duplicating the layer and never making any edits to the Background layer. 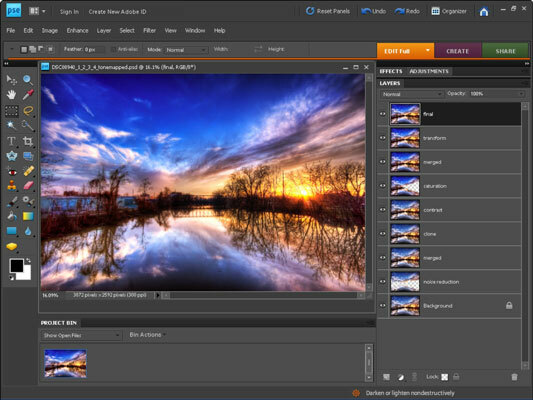 In this case, it is your tone mapped HDR image that you open up to create the Photoshop file. Keeping the Background layer safe makes it possible to compare your work with the tone mapped original, which in turn makes it possible to evaluate whether your changes look better or worse. Merge layers. Merged layers are special layers which combine the results of blended and semi-transparent layers into one opaque working layer. You can show/hide the merged layer by clicking the Eye icon to compare the merged layer against any other layer in the file. This makes it easy to evaluate your progress, and also provides a firm foundation to make more edits on. To create a merged layer, select the top, visible layer and then choose Select→All. (Should you have any layers above where you want to copy, click the Eye icon to hide them.) Next, choose Edit→Copy Merged. Finally, paste the merged layer at the top of the Layers palette and rename it. The figure shows what this looks like on the Layers palette. The Background layer is untouched and provides the blending base. Noise reduction has been applied to the sky and water, but erased from the trees and bridge. The merged layer rests on top, making the bottom two layers irrelevant except for situational awareness and backtracking purposes. Duplicate and do: Duplicate a layer, rename it, and then apply one adjustment to it: one — and only one — change. Keeping this simple makes it easy to track your changes, compare results, and backtrack if you need to. Final: The image that you use to save as the final full-sized image or as a new file to continue working. It’s the same as the last layer or a merged copy of semi-transparent layers beneath it, but named Final so you can see it immediately. 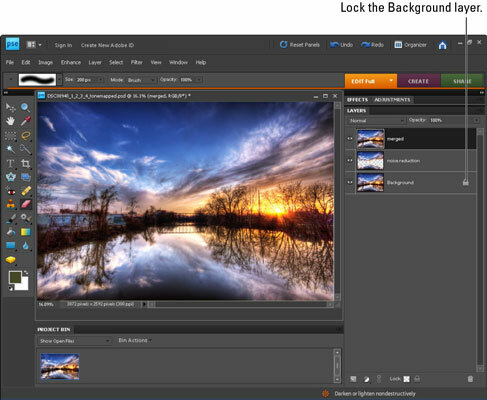 Transform: A layer where you had to rotate, reposition, or remove lens distortion. Merged: Combines the Saturation and Contrast layers, resulting in a solid layer with all the changes. Saturation: Contains a saturation adjustment. Areas you don’t want oversaturated are erased. Contrast: Contains a contrast adjustment. Areas where you want less contrast are erased. Clone: Contains the results of cloning out dust or other distractions. Merged: Combines the results of noise reduction with the previous merged layer. Noise reduction: Contains noise reduction, with areas you want left alone either erased or masked out.